Sorry, that email address does not exist. Please try again. Now you can be even closer with a QPAC membership. Are you a fan of musical theatre? Join the Musicals Waitlist and we will alert you to special priority booking offers so you can be among the first to secure your seats for the hottest show in town. With a contemporary menu and impeccable service, the quintessential QPAC experience begins at the Lyrebird. Showcasing the evolution of Aboriginal dance in South East Queensland. It celebrates the vibrancy and diversity of storytelling through this art form by exploring movement, language, body paint, instruments, and cultural exchange. Restaurateur Margaret Nguyen shares her thoughts on the role of food in bringing us together. Donate to QPAC today – and help create more local works, more life-changing experiences, and a more connected community. Join now for priority booking, discounts, news and entertainment and much more! Seats for patrons with mobility difficulties and Companion Card holders are not available online. Please call QTIX on 136 246 Monday to Saturday, 9am – 8.30pm to enquire or make your booking. A group discount may be available for this event. Please refer to the event page for further information. 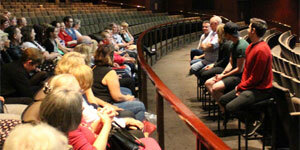 To make a group booking, please call QPAC Group Sales on (07) 3840 7466 or email groups@qpac.com.au. © 2019 Queensland Performing Arts Trust. All rights reserved.